The vibraphone (also known as the vibraharp or simply the vibes) is a musical instrument in the struck idiophone subfamily of the percussion family. It consists of tuned metal bars, and is usually played by holding two or four soft mallets and striking the bars. A person who plays the vibraphone is called a vibraphonist or vibraharpist. The vibraphone resembles the xylophone, marimba, and glockenspiel, one of the main differences between it and these instruments being that each bar is paired with a resonator tube that has a motor-driven butterfly valve at its upper end. The valves are mounted on a common shaft, which produces a tremolo or vibrato effect while spinning. The vibraphone also has a sustain pedal similar to that on a piano. With the pedal up, the bars are all damped and produce a shortened sound. With the pedal down, they sound for several seconds. 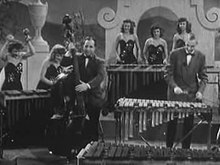 The vibraphone is commonly used in jazz music, in which it often plays a featured role and was a defining element of the sound of mid-20th-century "Tiki lounge" exotica, as popularized by Arthur Lyman. It is the second most popular solo keyboard percussion instrument in classical music, after the marimba, and is part of the standard college-level percussion performance education. It is a standard instrument in the modern percussion section for orchestras and concert bands. The first musical instrument called "vibraphone" was marketed by the Leedy Manufacturing Company in the United States in 1921. However, this instrument differed in significant details from the instrument now called the vibraphone. The Leedy vibraphone achieved a degree of popularity after it was used in the novelty recordings of "Aloha 'Oe" and "Gypsy Love Song" by vaudeville performer Louis Frank Chiha ("Signor Frisco"). This popularity led J.C. Deagan, Inc. in 1927 to ask its Chief Tuner, Henry Schluter, to develop a similar instrument. However, Schluter didn't just copy the Leedy design, he introduced several significant improvements: making the bars from aluminium instead of steel for a more "mellow" basic tone; adjustments to the dimensions and tuning of the bars to eliminate the dissonant harmonics in the Leedy design (further mellowing the tone); and the introduction of a foot-controlled damper bar so musicians can play it with more expression. Schluter's design was more popular than the Leedy design, and has become the template for all instruments now called vibraphone. However, when Deagan began marketing Schluter's instrument in 1928, they called it the vibraharp. The name derived from similar aluminum bars that were mounted vertically and operated from the "harp" stop on a theatre organ. Since Deagan trademarked the name, others were obliged to use the earlier "vibraphone" for their instruments incorporating the newer design. The name confusion continues, even to the present, but over time vibraphone became significantly more popular than vibraharp. By 1974, the Directory of the D.C. Federation of Musicians listed 39 vibraphone players and 3 vibraharp players. The initial purpose of the vibraphone was to add to the large arsenal of percussion sounds used by vaudeville orchestras for novelty effects. This use was quickly overwhelmed in the 1930s by its development as a jazz instrument. As of 2015, it retains its use as a jazz instrument, and is also established as a major keyboard percussion instrument, often used for solos, in chamber ensembles, and in modern orchestral compositions. 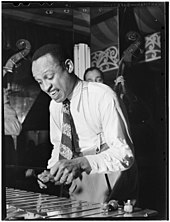 The use of the vibraphone in jazz was pioneered by Paul Barbarin, the drummer with Luis Russell's band. His playing can be heard on recordings by Henry "Red" Allen from July 1929 ("Biff'ly Blues" and "Feeling Drowsy"), and Barbarin played on the first recordings by Louis Armstrong to feature the instrument – "Rockin' Chair" (December 1929) and "Song of the Islands" (January 1930). The first classical composer to use the vibraphone in one of his pieces was Alban Berg, who used it prominently in his opera Lulu from 1937. Outside of the United States, the Premier Drum Company of London, after experimenting with a variety of aluminum bar instruments more closely related to the glockenspiel that were called variations of “harpaphone”, moved to the production of the Schluter vibraphone design. Bergerault, of Ligueil, France also began manufacturing vibraphones in the 1930s. Throughout the 1930s and 1940s, each manufacturer attracted its own following in various specialties, but the Deagan vibraphones were the models preferred by many of the emerging class of specialist jazz players. Deagan struck endorsement deals with many of the leading players, including Lionel Hampton and Milt Jackson. The Deagan company went out of business in the 1980s; its trademark and patents were purchased by Yamaha. Yamaha continues to make percussion instruments based on Deagan designs. In 1948, the Musser Mallet Company was founded by Clair Omar Musser, who had been a designer at Deagan. The Musser company continues to manufacture vibraphones as part of the Ludwig Drum Company. The standard modern instrument has a range of three octaves, from the F below middle C (F3 to F6 in scientific pitch notation). Larger three-and-a-half or four octave models from the C below middle C are also becoming more common (C3 to F6 or C7). Unlike its cousin the xylophone, it is a non-transposing instrument, generally written at concert pitch. However, composers occasionally (for example, Olivier Messiaen) write parts to sound an octave higher. In the 1930s several manufacturers made soprano vibraphones with a range C4 to C7, notably the Ludwig & Ludwig model B110 and the Deagan model 144. Deagan also made a portable model that had a ​2 1⁄2 octave range and resonators made of cardboard (model 30). The major components of a vibraphone are the bars, resonators, damper mechanism, motor and the frame. 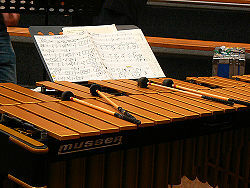 Vibraphones are usually played with mallets. Vibraphone bars are made from aluminum bar stock, cut into blanks of pre-determined length. Holes are drilled through the width of the bars so they can be suspended by a cord. To maximize the sustain of the bars, the holes are placed at approximately the nodal points of the bar, i.e., the points of minimum amplitude around which the bar vibrates. For a uniform bar, the nodal points are located 22.4% from each end of the bar. Material is ground away from underside of the bars in an arch shape to lower the pitch. This allows the lower-pitched bars to be a manageable length. It is also the key to the "mellow" sound of the vibraphone (and marimba, which uses the same deep arch) compared with the xylophone, which uses a shallower arch, and the glockenspiel, which has no arch at all. Vibrating rectangular bars have three primary modes of vibration. The deep arch causes these modes to align and create a consonant arrangement of intervals: a fundamental pitch, a pitch two octaves above that, and a third pitch an octave and a major third above the second. For the F3 bar that usually forms the lowest note on a vibraphone, there would be F3 as the fundamental, F5 as the first overtone and A6 as the second overtone. As a side effect, the arch causes the nodal points of the fundamental vibration to shift closer towards the ends of the bar. After beveling or rounding the edges, fine-tuning adjustments are made. If a bar is flat, its overall pitch structure can be raised by removing material from the ends of the bar. Once this slightly sharp bar is created, the secondary and tertiary tones can be lowered by removing material from specific locations of the bar. Vibraphones are tuned to a standard of A=442 Hz or A=440 Hz depending on the manufacturer or in some cases the customer's preference. Like marimbas, professional vibraphones have bars of graduated width. Lower bars are made from wider stock, and higher notes from narrower stock, to help balance volume and tone across the range of the instrument. The bars are anodized, typically in silver or gold color, after fine tuning, and may have a smooth or brushed (matte) finish. These are cosmetic features with a negligible effect on the sound. Resonators are thin-walled tubes, typically made of aluminum, but any suitably strong material will do. They are open at one end and closed at the other. Each bar is paired with a resonator whose diameter is slightly wider than the width of the bar, and whose length to the closure is one-quarter of the wavelength of the fundamental frequency of the bar. The resonator for A3 (the lowest A on a vibraphone) is approximately 15 inches long. When the bar and resonator are properly in tune with each other, the vibrating air beneath the bar travels down the resonator and is reflected off the closure at the bottom, then returns to the top and is reflected back by the bar, over and over, creating a much stronger standing wave and increasing the amplitude of the fundamental frequency. The resonators, beside raising the upper end of the vibraphone's dynamic range, also affect the overall tone of the vibraphone, since they amplify the fundamental, but not the upper partials. Note the difference in the front resonator sets of the two vibraphones. This difference is purely cosmetic. On Locke's vibraphone (on the right) the resonators are only as long as they need to be, and the cap in each tube is near the bottom. On Hutcherson's vibraphone, the resonators on the high end are much longer than they need to be to produce an arched front, as seen in many instruments (the cap is near the top of those tubes). Both instruments include non-functional resonator tubes with no corresponding bar above to avoid a "gap-toothed" look. There is a trade-off between the amplifying effect of the resonators and the length of sustain of a ringing bar. The energy in a ringing bar comes from the initial mallet strike, and that energy can either be used to make the bar ring louder initially, or not as loudly but for a longer period of time. This is not an issue with marimbas and xylophones, where the natural sustain time of the wooden bars is short, but vibraphone bars can ring for many seconds after being struck, and this effect is highly desirable in many circumstances. Therefore, the resonators in a vibraphone are usually tuned slightly off-pitch to create a balance between loudness and sustain. A unique feature of vibraphone resonators is a shaft of rotating discs, commonly called fans, across the top. When the fans are open (vertical) the resonators have full function. When the fans are closed (horizontal) the resonators are partially occluded, reducing the resonance of the fundamental pitch. A drive belt connects the shafts to an electric motor (see below) beneath the playing surface, and rotation of the fans creates what many people call a "vibrato" effect; however in actuality it is a tremolo, i.e. periodic modulation of amplitude, not pitch. In 1970 Deagan introduced a model, the Electravibe, that dispensed with resonator tubes entirely and took a signal directly off the bars, adding a tremolo in a preamplifier. This improved the portability of the instrument as well as solving the problem of miking the bars evenly that is inherent in all the tuned mallet instruments. For the first few years of production the original Leedy Vibraphone did not include a mechanism for damping, or stopping, the sustaining tones. In 1928 the J.C. Deagan company introduced a pedal mechanism that has not changed substantially since. A rigid bar beneath the center of the instrument is pressed upward by an adjustable spring, and engages a long felt pad against the sharps and the naturals. A foot pedal lowers the bar and allows notes to ring freely; releasing the pedal engages the damper and stops any vibrating notes. Vibraphones usually have an electric motor and pulley assembly mounted on one side or the other to drive the disks in the resonators. The early vibraphones used motors that were intended to power record player turntables, and had limited or no speed adjustment capabilities. Whatever speed adjustments were possible were made by moving the drive belt among a small number of pulleys (usually three) of varying diameters. Later, variable-speed AC motors became available at reasonable prices. These motors allow the adjustment of the rotating speed via a potentiometer mounted on a control panel near the motor. They typically support rotation rates from about 1–12 Hz. These motors remained the preferred solution until the 1990s, and are still in use. The vibraphone frame offers a number of challenges to designers. It must be sturdy enough to endure the torsional forces created by the damper/spring/pedal assembly and the stresses of repeated transport and playing, while still being light enough for easy transport. Considering the weight of the bars alone, that doesn’t leave much left for the frame. Also, the bars must be securely attached to the frame, but not rigidly. Each bar must have some independent flex for it to ring. The motor is attached to the frame at one end. The hinges for the damper bar are attached at each end, and the spring assembly and the pedal are usually aligned in the middle. Two banks of resonator tubes are laid into grooves in the frame so that they straddle the damper bar. The resonators are not firmly fastened to the frame. The ends of the shafts that gang the disks are attached to the drive of the motor via a drive belt similar to an O-ring. A bed for the bars is made by laying four wooden rails onto pins on the end blocks. Like the resonators, these rails do not firmly attach to the frame. Each rail has a series of pins with rubber spacers that support the bars. The bars are arranged into two groups, and a soft cord passes through the nodal holes in the bars of each group. These bars lay between the support pins, with the cord hooking the pins. On the outside rails, the pins have U-shaped hooks and the cord rests in the bend. the inside pins have a hook that grasps the cord and holds the bars in place against the force of the damper pad. The two ends of the cord attach with a spring at one end to provide tension and flex. Vibraphone mallets usually consist of a rubber ball core wrapped in yarn or cord and attached to a narrow dowel, most commonly made of rattan or birch and sometimes of fiberglass or nylon. Mallets suitable for the vibraphone are also generally suitable for the marimba. The specific mallets used can have a great effect on the tonal characteristics of the sound produced, ranging from a bright metallic clang to a mellow ring with no obvious initial attack. Consequently, a wide array of mallets is available, offering variations in hardness, head size, weight, shaft length and flexibility. Classical players must carry a wide range of mallet types to accommodate the changing demands of composers who are looking for particular sounds. Jazz players, on the other hand, often make use of multi-purpose mallets to allow for improvisation. The world of vibraphone players can be roughly divided into those who play with two mallets, and those who play with four. In reality the division is not quite so neat. Many players switch between two, three and four mallets depending on the demands of their current musical situations. Furthermore, concentrating on the number of mallets a player holds means missing the far more significant differences between the two-mallet and four-mallet playing styles. The two-mallet approach to vibes is traditionally linear, playing like a horn. [clarification needed] Two-mallet players usually concentrate on playing a single melodic line and rely on other musicians to provide accompaniment. Double stops (two notes played simultaneously) are sometimes used, but mostly as a reinforcement of the main melodic line, similar to the usual use of double stops in solo violin music. In jazz groups, two-mallet vibraphonists are usually considered part of the "front line" with the horn players, contributing solos of their own but contributing very little in the way of accompaniment to other soloists. Two-mallet players use several different grips, with the most common being a palms-down grip that is basically the same as the matched grip used by drummers. The mallets are held between the thumb and index finger of each hand, with the remaining three fingers of each hand pressing the shafts into the down-facing palms. Strokes use a combination of wrist movement and fingertip control of the shaft. Milt Jackson, circa 1980. Note his characteristic palms-inward two-mallet grip. Another popular grip is similar to the timpani grip. The mallets are again held between the thumb and index fingers and controlled with the remaining three fingers, but the palms are held vertically, facing inward towards each other. Most of the stroke action comes from the finger-tip control of the shafts. Passages are usually played hand-to-hand with double-sticking (playing two notes in a row with the same hand) used when convenient in minimizing crossing the hands. The player must pay close attention to the damper pedal to play cleanly and avoid multiple notes ringing unintentionally at the same time. Because the notes ring for a significant fraction of a second when struck with the damper pad up, and ringing bars do not stop ringing immediately when contacted by the pad, players use a technique called after pedaling. In this technique, the player presses the damper pedal slightly after striking the bar—shortly enough so the recently struck note continues to ring, but long enough so that the previous note stops ringing. In another damper technique—half pedaling—the player depresses the pedal just enough to remove the spring pressure from the bars, but not enough to make the pad lose contact with the bars. This lets the bars ring slightly longer than with the pad fully up and can make a medium-fast passage sound more legato without pedaling every note. The four-mallet vibraphone style is multi-linear, like a piano. "Thinking like a pianist, arranger, and orchestrator, the vibist approaches the instrument like a piano and focuses on a multi-linear way of playing." In jazz groups, four-mallet vibraphonists are often considered part of the rhythm section, typically substituting for piano or guitar, and providing accompaniment for other soloists in addition to soloing themselves. Furthermore, the four-mallet style has led to a significant body of unaccompanied solo vibes playing. One notable example is Gary Burton’s performance of "Chega de Saudade (No More Blues)" from his Grammy-winning 1971 album "Alone at Last". Although some early vibes players made use of four mallets, notably Red Norvo, Adrian Rollini, and sometimes Lionel Hampton, the fully pianistic four-mallet approach is almost entirely the creation of Burton. Many of the key techniques of the four-mallet style, such as multi-linear playing and the advanced dampening techniques described below, are easily applied to playing with two mallets and some modern two-mallet players have adapted these devices to their playing, somewhat blurring the distinctions between modern two- and four-mallet players. Vibraphonist Gary Burton and guitarist Julian Lage. Note Burton's four-mallet grip. The most popular four-mallet grip for vibraphone is the Burton grip, named for Gary Burton. One mallet is held between the thumb and index finger and the other is held between the index and middle fingers. The shafts cross in the middle of the palm and extend past the heel of the hand. For wide intervals, the thumb often moves in between the two mallets and the inside mallet is held in the crook of the fingers. Also popular is the Stevens grip, named for marimbist Leigh Howard Stevens. Many other grips are in use, some variations on the Burton or Stevens, others idiosyncratic creations of individual vibes players. One common variation of the Burton grip places the outside mallet between the middle and ring fingers, instead of between the index and middle. Vibraphonist Joe Locke's idiosyncratic four-mallet grip. Many vibes players adapt the "standard" grips by varying degrees. Four-mallet vibists usually play scalar linear passages much the same as two-mallet players, using one mallet from each hand (outside right and inside left for Burton grip), except four-mallet players tend to make more use of double strokes, not only to avoid crossing hands but also to minimize motion between the two bar rows. For example, an ascending E flat major scale could be played L-R-R-L-L-R-R-L, keeping the left hand on the "black" bars and the right hand on the "white". For linear passages with leaps, all four mallets are often used sequentially. Pedaling techniques are at least as important for the four-mallet vibist as for two-mallet players, but the all-or-nothing dampening system of the pedal/pad presents many obstacles to multi-linear playing since each line normally has its own dampening requirements independent of the other lines. To overcome this, four-mallet players use a set of dampening techniques referred to as "mallet dampening", in addition to the pedaling techniques used by two-mallet players. The mallet dampening techniques "are to the vibist as garlic and fresh basil are to the Northern Italian chef" and contribute significantly to expressive four-mallet playing. Mallet dampening includes "dead strokes" where a player strikes a bar, and then instead of drawing the mallet back, directly presses the head of the mallet onto the bar, causing the ringing to immediately stop. This produces a fairly distinctive "choked" sound and dead strokes are often used just for that particular sound in addition to the dampening aspects. In hand-to-hand dampening, the vibist plays a note with one mallet, while simultaneously pressing another mallet onto a previously ringing bar. Usually the dampening mallet and the striking mallet are held in different hands, but advanced players can, in some circumstances, use two mallets from the same hand. This is the most powerful of the mallet dampening techniques as it can be used to dampen any note on the instrument while simultaneously striking any other note. Slide dampening can be used to dampen a note that is physically adjacent to the new note being struck. The player strikes the new note and then controls the rebound of the mallet so that it slides over and onto the note to be dampened. Sometimes slide dampening can make the new note sound "bent" or as if there is a glissando from the dampened note to the ringing one, as the two notes normally ring together for some short period of time. Hand dampening (also known as finger dampening) can be used to dampen a white note while striking a nearby black note. As the player strikes a black note with a mallet, they simultaneously press the heel of their hand or the side of their pinky finger onto the ringing white bar, using the same hand to strike the black note and dampen the white note. Using both hands, it's possible to dampen and strike two notes at once. Matthias Lupri using 2 cello bows on a vibraphone with electronic pickups, Vancouver Jazz Festival 2005. Five or six mallets: To achieve denser sound and richer chord voicings, some vibraphonists have experimented with three mallets per hand, either in both hands for a total of six mallets or in just the left hand for a total of five. Bowing: A cello or bass bow can be used to achieve sustained tones that neither decay nor have a percussive attack. Steve Reich's Sextet uses this effect. Bernard Herrmann used the vibraphone extensively in many of his film and television scores, most notably in his scores for Fahrenheit 451 and The Alfred Hitchcock Hour. Wikimedia Commons has media related to Vibraphones. ^ a b Blades, James; Holland, James. "Vibraphone." Grove Music Online. Oxford Music Online. Oxford University Press. Accessed August 17, 2015. http://www.oxfordmusiconline.com/subscriber/article/grove/music/29286. ^ Strain, James A. "John Calhoun Deagan". Hall of Fame. Indianapolis, IN: Percussive Arts Society. Archived from the original on 2016-01-30. Retrieved 2016-01-23. ^ "Percussion - Musical Instruments". Yamaha. Retrieved 2016-01-23. ^ "Musser". Our Brands. Conn-Selmer, Inc. Archived from the original on 2015-12-22. Retrieved 2016-01-23. ^ Paterson, Robert (2004). Sounds That Resonate: Selected Developments in Western Bar Percussion During the Twentieth Century. Cornell University: UMI Dissertation Services No. 3114502. p. 182.